Founded by Donald Miller (1934 – 1984), Miller Insulation is now owned by Miller Enterprise, an employee-owned company. Miller Insulation Company offers services in commercial & residential contracting, industrial insulation, oilfield, and professionally engineered scaffolding services and equipment. From our early beginnings in the oil fields to complete refinery service and maintenance today, Miller Insulation takes great pride in the reputation we have earned within the industry. 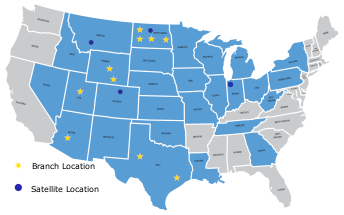 Today, Miller Insulation operates out of seven independent branch offices serving customers across the U.S. In addition to daily overview of our clients' projects by skilled Foreman and Project Managers, all Miller Insulation Branch General Managers are highly experienced, hands-on leaders. Combined, our seven Branch General Manager's represent decades of Miller Insulation experience with the company's executive leadership experience even more impressive. And, our insulating crews… well, they simply are the best there is. Miller Insulation values skills and experience in its workforce and offers employee benefits and programs which target employee retention. Along with our regular employee base, we have an extensive contact database of skilled and experienced insulators, carpenters and scaffold builders. Miller not only has a drug and alcohol abuse policy, we strictly enforce it, along with all eligibility to work regulations. While our insulation work may not always be visible, our name and reputation will always be up front.